Karima Bennoune: Can you explain why you founded the Barakat Movement? Mustapha Benfodil protests for freedom of expression in front of Algeria's national TV station on March 24Mustapha Benfodil: The Barakat Movement was born out of the desire of a group of citizens to respond to the Algerian regime’s efforts to keep President Abdelaziz Bouteflika in power, even though he is ill and entirely unable to discharge his constitutional duties. Through this candidacy, the regime is sending a signal that it is willing to enter into a confrontation with the society. There are different constituencies within the regime. They include the presidential camp around President Bouteflika and his brother, Said Bouteflika, on one side. There is General Toufik who was always the real president of Algeria. There is the DRS (Department for Information and Security, an internal intelligence agency), and the military leadership, and there are even some elements within the army who want to change things. When the candidacy of Mr. Bouteflika was announced, there was a consensus about this, even if a fragile one, among these different forces. Meanwhile, there is a strong demand from the society for change. But the regime responds by saying, ‘we want to retain the authoritarian status quo.’ Algerian society is terribly afflicted by political fatalism and inertia. A large majority of Algerians believe that absolutely nothing can be done to change this political situation. KB: What were the factors that created such a political climate in Algeria? MB: The good economic health of Algeria - which is exclusively due to oil revenues, not to the president’s economic program - has benefited the ruling class. However, it has not benefited the Algerian people very much. During the last 15 years, billions of dollars have been poured into poorly considered programmes that have had a small impact on the daily lives of Algerians. There have been some steps taken in terms of infrastructure, but in terms of social issues there have been many things that have been very badly run due to corruption and poor governance. In the 2000s, the politics of President Bouteflika and his team were based on corrupting the society - the political class, the media, and even the unions. They wanted to buy everyone through the politics of the chequebook. They created a citizenry that is completely passive. We also suffered from the after effects of the way Algerian society was shaken by the Islamist terrorism of the 90s. Afterwards people wanted to have a normal life. Algerians withdrew from political life en masse. We saw the emergence of a new pseudo-middle class and we drifted into consumption, accompanied by the destruction of the national companies and the national economy. This constituted a wild neo-liberalism. What did this produce in the middle of the first decade of the 21st century? A new rich class on one side - a business class that supported the regime naturally and are its clients - and on the other side a pseudo-middle class that does not want to be involved in politics, even in its own neighborhoods. We witnessed the complete disintegration of the society. This started during the time of terrorism, with the squandering of the achievements of our own “Arab Spring” of October 88. Terrorism destroyed civil society. There were mass assassinations of intellectuals and civil society activists. And then, later on, civil society was destroyed by dirty money. So, by 2008, we reached the lowest level you can imagine. And that is when Bouteflika took advantage of the generalized lethargy and passed an amendment - with votes of deputies who had themselves been bought off - that gave him authorization for a presidency-for-life. KB: What has the impact of Bouteflika’s politics been on Algeria and how does Barakat seek to respond? MB: From 2008 onward, we saw that the biggest danger was the destruction of citizenship in Algeria. The Algerian of the 21st century is broken, bullied, castrated. So, the Barakat movement was born from a desire to rehabilitate citizenship and to restore popular sovereignty. The critics of Barakat say you must accept that nothing is possible in Algeria - the Algerian people as a whole should take up residence in the cemetery of El Alia. It is a discourse of submission. This was the achievement of Bouteflika and his team, and the DRS, and the political police. They broke the people as a whole and Algerians as citizens. Barakat means, above all else, saying Barakat (Enough!) to submission. We refuse the politics that made us subjects of Mr. Bouteflika. KB: Can you explain how the history of recent political contestation in Algeria, since at least 2011, and perhaps even earlier, has led up to the emergence of the Barakat Movement? A young Barakat support demonstrates for freedom of expression at the national TV station on March 24.MB: Things were moving here, at the same time as in Tunisia, in the beginning of January 2011. There were riots at the same time as the self-immolation of Bouazizi. We had not seen something similar since October 1988. The government’s communication team wanted to break this movement. They labelled these events ‘riots of sugar and oil,’ as if Algerians were not capable of claiming their dignity. They are digestive tracts only. So, it was urgent, like in October 88, to give this popular uprising a political superstructure. In response to this need, the National Coordination for Change and Democracy (CNCD) formed, but personality struggles and political dissention led to its break up. At that time, I was active in a group called Bezzef that carried out small citizen actions, but nothing on the level of Barakat. We were getting ready to react because we felt we must do something quickly to restore citizenship. But we all thought that in 2014 we will have a change and the regime will be obliged to make concessions. We were sure Bouteflika would not run again. And there might even be a new president, perhaps from within the regime, who - under pressure from the society - would undertake a few reforms. Then, on 22 February 2014, we had our answer. Bouteflika announced his candidacy by proxy with contempt for protocol, morals and ethics. Happily, there are still some Algerians – women and men – who want to defend our dignity, including Amira Bouraoui. 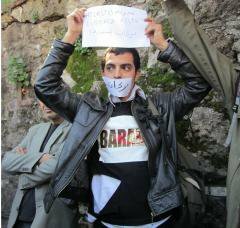 The group organized around Dr. Bouraoui went out to protest on the morning of 22 February. Meanwhile, I wrote a manifesto for counter-elections, saying we must work with the population and try to change the balance of power, or we will have a civil war in Algeria. I, myself, am marked by the years of terrorism. I launched an appeal for a meeting in Algiers, for all those who want to think of political solutions to come together. This is how we joined with the group of Amira Bouraoui, and Barakat was born. KB: The Barakat Movement calls for a democratic transition. What does that mean? MB: There are two schools of thought. One thinks that a transition will be like the beginning of the 90s – an interruption of elections, and a transitional government. I do not support this. My idea is to work within the existing structure. For example, we never said to stop the electoral process. We respect the elections as they are even if we know there will be fraud. We call on Algerians to stay home on election day, April 17, so as to say to the regime that these are not our elections. You are spending money and asking us to waste our time on elections that you do not believe in. Then, on 18 April Barakat will likely take to the streets and call for the application of Article 88 of the Constitution. This provision holds that in case of physical incapacity, the Constitutional Council should meet to relieve the president of his functions. Then there is a short time when the country is run by the president of the senate until there are elections. They did not do this last time because they were afraid, and the regime was strong. But, things are changing. There are political parties and sectors of the society that are on the move. So, maybe we have a chance to apply Article 88. We already appealed to the Constitutional Council once before, saying, ‘Don’t you want to be able to look your children in the eye, and say we did our jobs?’ We said ‘we appeal to your conscience. When you sleep at night you will think of Barakat and of the signature you put on the document saying Bouteflika is well enough to govern. You know you are lying. And you know we know you are lying. And you will be judged by history.’ We will do this again if the Constitutional Council validates this masquerade. They have to provide a medical certificate. Yesterday, Bouteflika exposed them when he said in his own letter that he is very sick. We will say ‘apply Article 88,’ even if it will not work. KB: What is the long term agenda of Barakat, after the April 17 elections? MB: We will work with all political and social forces for a consensus around a draft constitution. If we can even get the limit of presidential terms to two, like in the time of President Zeroual, this would be an advance. There will be progressive change. We ourselves do not want too brutal of a change, because either there will be suicidal types who can bring us down with them, or there could be a moment of terrible political instability. We want the state to keep functioning. And we will engage at every level, whether about issues like the constitution or municipal and legislative elections, or on other sectorial questions. For example, the multi-nationals are colonizing Algeria again. We say we need a second independence. We will also scrutinize public spending. How can we not demand an accounting from these people? KB: So you are talking about reform, not revolution? MB: Yes, because we are not an insurrectional movement. Given the terrorism we suffered in the 90s, and the damage caused by the “Arab Spring” - which either brought the army or extremist movements to power in different countries - reform is better. We do not want a violent solution. We are profoundly traumatized. No country knew the violence we did. I am against the “Arab Spring.” For us, the most important mission of Barakat is to offer political mediation. We understand that either we will have politics and a political solution, or chaos. Within Barakat, there is both a movement, and an initiative. The Barakat initiative is a consensual political project. We just finished our first month. Today we demonstrated in front of the national TV. We want to take concerted action that will probably assume the form of a new constitution. KB: Can you describe the activists of Barakat? Who are they? MB: We have a mix of people among our activists. At first, we were particularly identified with certain personalities, like Amira Bouaroui who is a gynecologist. In the founding meetings we held between 22 and 27 February, which were decisive for the movement, the participants were mainly middle class people, intellectuals, journalists, lawyers, doctors, civil society activists, and students. The average age is between 20 and 30. Over time, everyone joined in. We were accused of being feminists, gays, drinkers and Kabyles (Amazight/Berber). I say, thank you for the four compliments, because we are for diversity. Now, we also have supporters who are from the popular class. They recognized Barakat as a rallying symbol. They have taken to heart a slogan which is now everywhere. I am stopped in the street all the time, every day, by people who make political suggestions. This is citizenship restored. We begin to have the kind of citizens who say I do not agree, but they discuss this with you without getting angry. Our meetings, and even our experience of arrests, awaken new traditions of activism that we had lost. Politics had become taboo. Slowly, people are beginning to come back to politics. Our strength is our organization. We are ready to sacrifice and lose our jobs and be arrested. We cannot be bought off. KB: Barakat’s protest this morning at the National TV station had a significant media impact, but the protestors were small in number. Do you aim for mass mobilization? MB: We have modest goals. We are not going to change the world, or Algeria as a whole. But even appearing in front of the national TV station with ten people is in itself an achievement here. We cannot expect too much. We are not bothered by numbers. We are not politicians. When someone proposed to me to mobilize a mass protest I replied, only if you can assure me no one will be killed. I am happy to have ten people and to know who they are, and then they go home safely. Real civil society is not a question of numbers or money. KB: Barakat is an Algerian movement, with messages aimed at Algerians. However, what should the international community or civil society elsewhere understand about your struggle? MB: To the formal international community of governments, we say, “leave us in peace. Don’t interfere with us. We will take care of our own problems.” The solution will not come from outside. We know there are many who would like to use us. We are not naïve about this. We do not even want any financing. The best support is just to let us do things in our own rhythm. 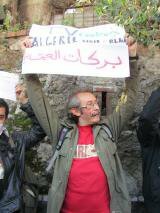 This is an Algerian movement that is happening inside Algeria. For Algerians outside who want their country to change, we ask them to organize and not to fight amongst themselves, because Barakat is a movement to federate people. It is an entirely non-violent movement. I am always pleased to work with people in civil society who struggle. There is a global movement of peoples to retake sovereignty. All these peoples’ movements are working for the same things. It is not just the countries of the Third World that have work to do. Even in the world’s leading democracies there is work to be done.